John and I wanted to get together for a potluck fun summer dinner in mid-June. I agreed to make appetizers and bring the meat. Since John doesn’t have a grill, I wanted to grill something so we can all have a summer taste. I saw this recipe in Food and Wine and knew it was the perfect thing right away. It had all of my requirements for a perfect recipe – simple and fresh ingredients, simple steps, and delicious, clean taste. 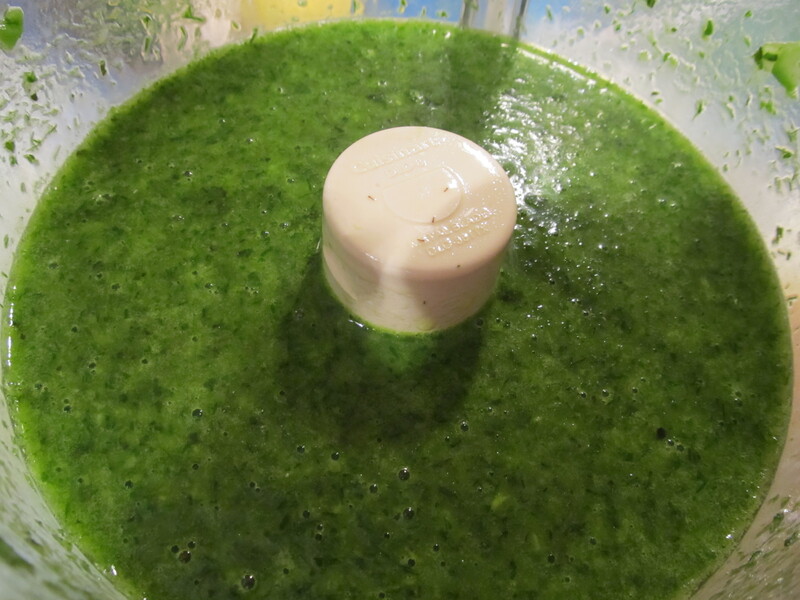 It couldn’t be easier than putting everything into the food processor and pressing “on”. It came together in NO time at all. 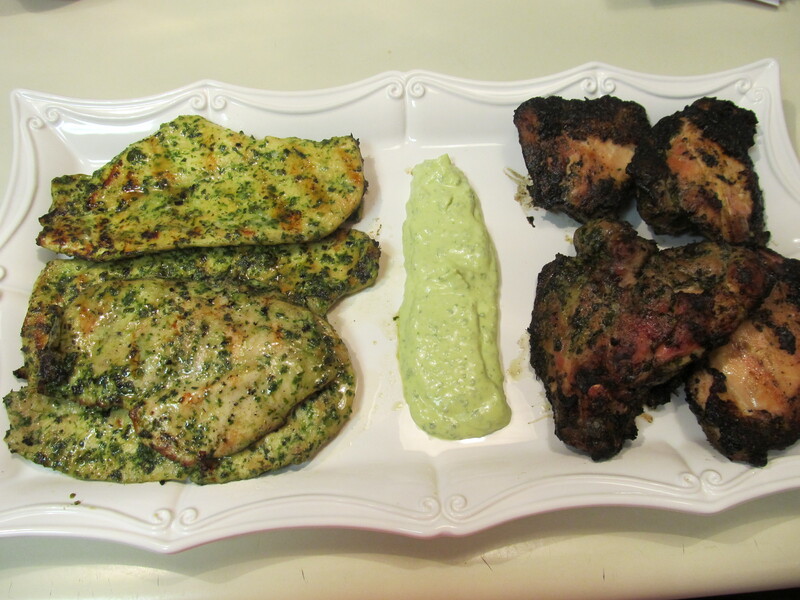 The chicken is definitely a bit off-putting all bright green…..It looks a bit funky. 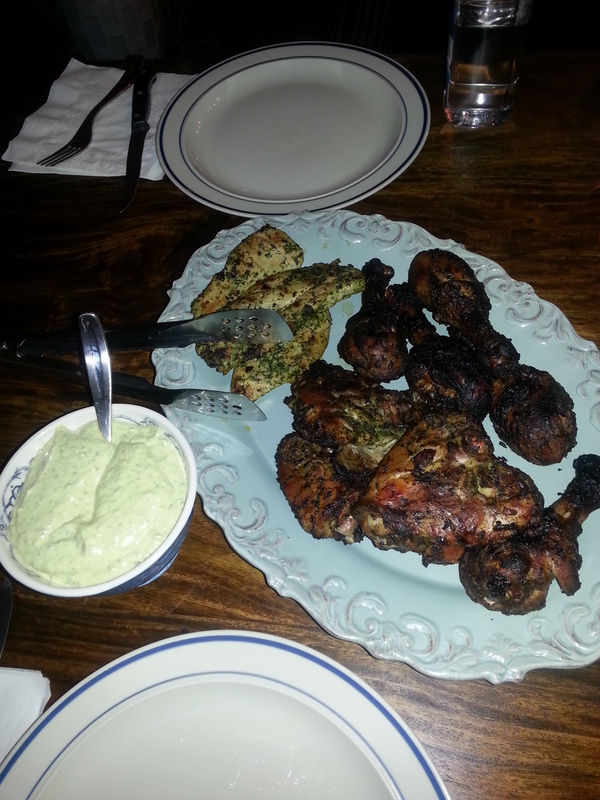 The aioli tastes delicious accompanying the chicken. I recommend making a bit more than the recipe calls for since everyone will want lots of it. This is really amazing. It tastes perfectly bright and fresh. It would pair great with a grain salad and some sliced red tomatoes with some balsamic on the side to make a really healthy, light summer dinner. Okay. 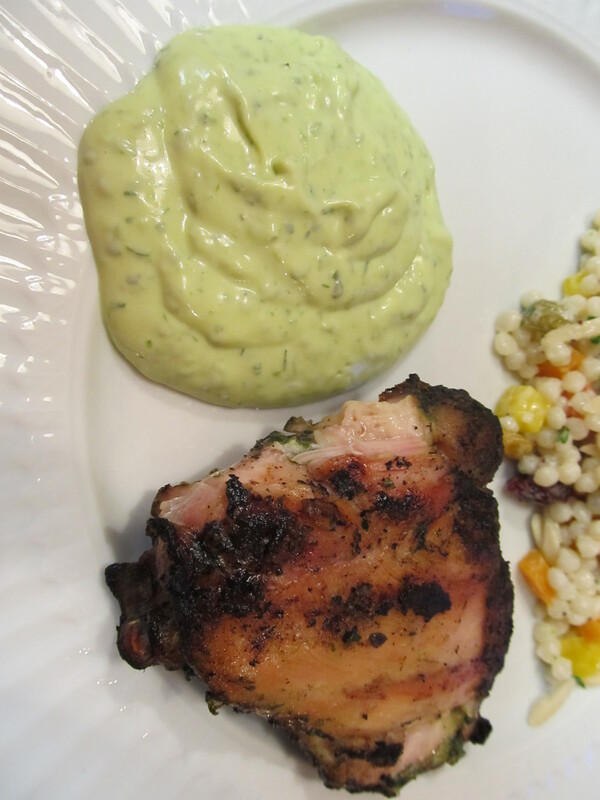 Go outside to your herb garden and collect all the ingredients and make this chicken NOW for your next BBQ or get-together. This stuff is off the HOOK!!!!! Everyone will want more. 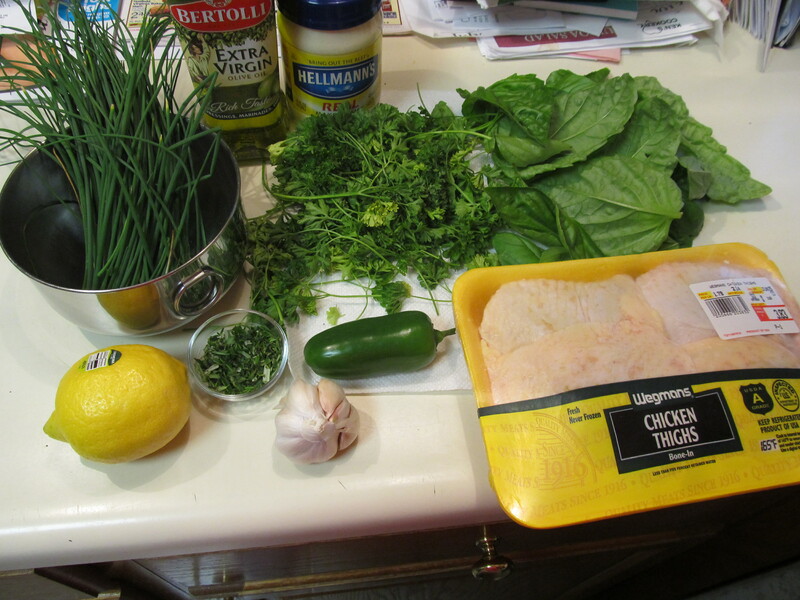 Okay – just a couple more pics first……this recipe is worth it. After making this 3 times this summer, I can DEFINITELY say you will adore this chicken like we do. 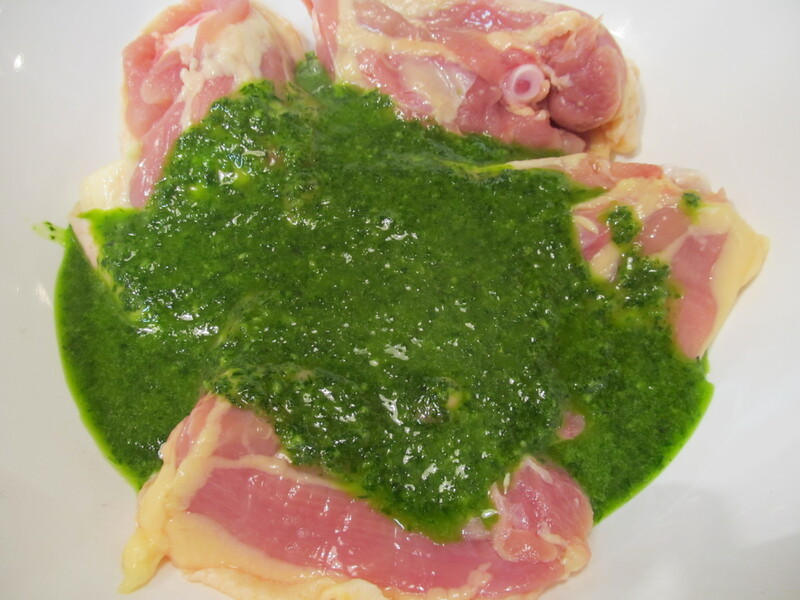 Using a sharp knife, score each piece of chicken a couple times through the skin so that the marinade can penetrate. Put chicken in a large bowl and set aside. 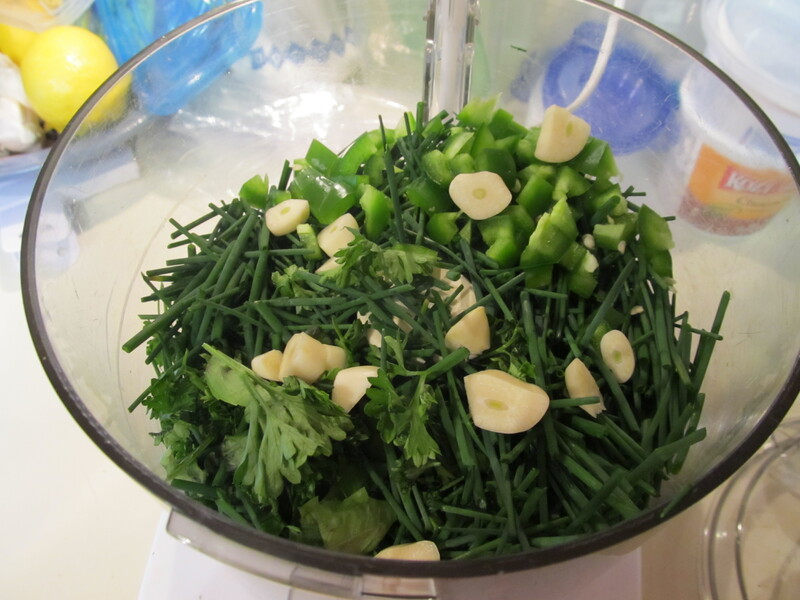 In a food processor, combine the parsley, basil, chives, rosemary, jalapeno, thyme, garlic, and 1 tblsp salt. Pulse until the herbs are finely chopped. With the machine on, add the 1 cup of olive oil in a steady stream. 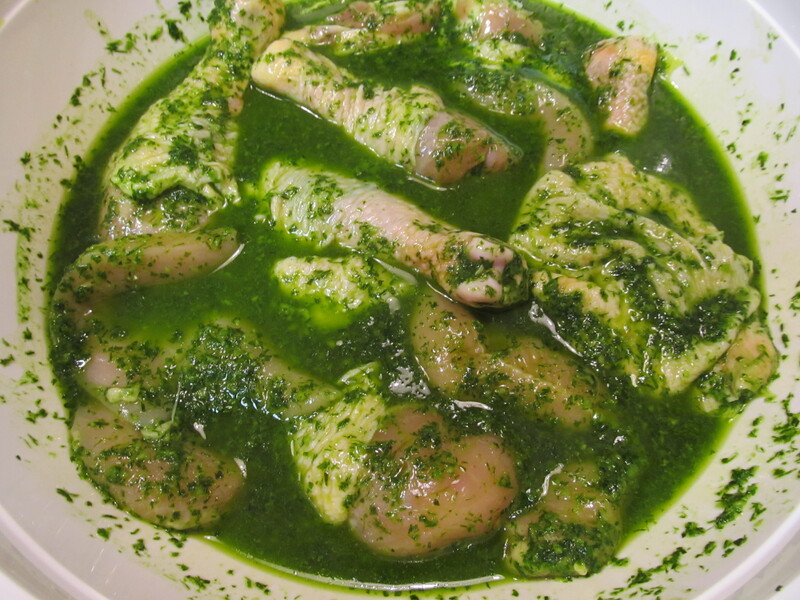 Pour all but ½ cup of the marinade over the chicken and turn to coat. Rub the marinade into the gashes of the chicken. Refrigerate the chicken and marinate for at least 4 hours or overnight (I prefer to marinate overnight for maximum flavor). 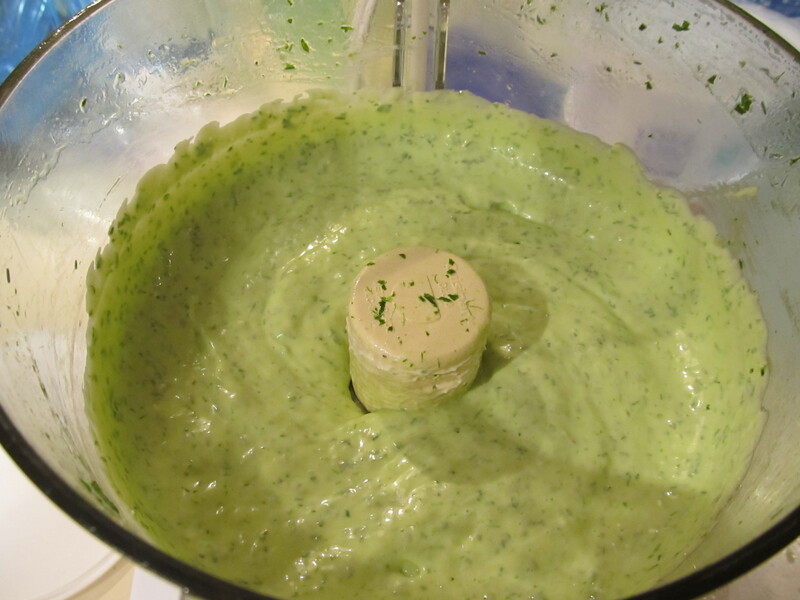 Add the mayonnaise and lemon juice to the remaining marinade in the processor and pulse until bright green. 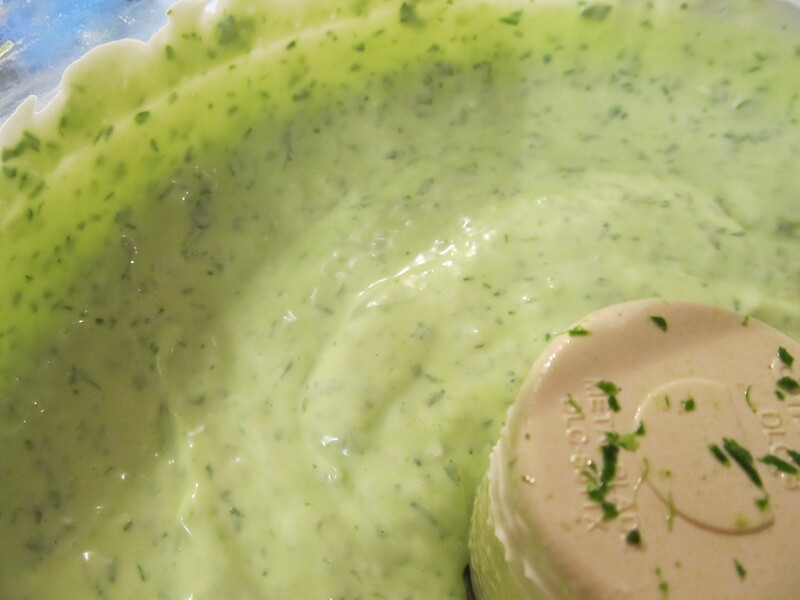 Scrape the green aioli into a small bowl and refrigerate. When chicken is marinated and you are ready to make dinner, light a grill and oil the grates. Grill the chicken over medium heat, turning occasionally until lightly charred and an instant-read thermometer reads about 168 – about 35 minutes. If you don’t have a grill or prefer not to grill, you can also preheat the broiler in your oven and set a rack in the lower third of the oven. Then arrange the chicken skin-side up on a rimmed baking sheet. Broil for about 40 minutes, turning occasionally. *Note – You can use boneless and/or boneless/skinless chicken as well – but the cooking time will be much less (about 12 minutes).